Spain’s Social Security system is expected to go broke by 2018. In the US, concerns over such matters are virtually nonexistent. But Spain cannot print Euros, and is already deep in the hole on meeting budget deficit targets. 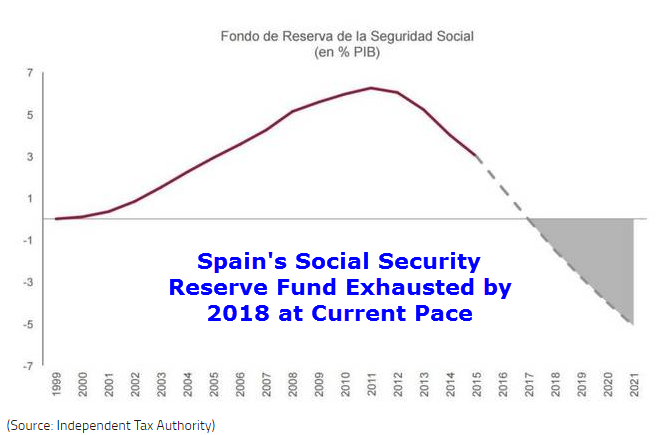 Via translation from El Confidencial, Spain’s Social Security Reserve Fund Exhausted by 2018. The Social Security reserve fund will run out of money in 2018. The cause in bonus payments to pensioners, which consumes every six months (in December and July) over 8.5 billion euros. Revenue from social security contributions are not sufficient to meet the payment obligations. Starting in 2018, only an extraordinary contribution by the State would make it possible for Social Security can meet its commitments. The financial problems of Social Security are not a temporary problem. The government itself expects that this year the public pension system will register equivalent to 1.1 percent of GDP deficit (about 11 billion euros ), while in 2017 planned is an imbalance equivalent to 0.9% of GDP. In 2016, revenues from social security contributions recorded an accumulated a deficit of 12.24% compared to expectations. The deviation is even higher than the already recorded in 2015. Spain has missed watered down budget deficit targets a half-dozen times. Spain is already under pressure from Brussels to cut spending or hike taxes, by 8 billion euros.